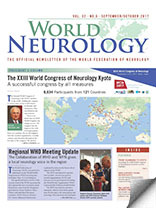 The biennial World Congress of Neurology is the WFN’s window to the world. Holding the congress in various parts of the world ensures its diversity and uniqueness. This was definitely the case in Kyoto. There is no doubt that the XXIII World Congress was a huge success. The congress was the largest so far, with 8,634 participants from 121 countries. We are all delighted with the excellent organization, scientific content, and education throughout the five days of the congress. The plenary sessions provided a major insight into the scientific basis and the global situation of neurology. Lectures from three Nobel laureates opened doors for all of us and made us think of all of the possible pathways for translational research. Researchers and clinicians presented many major topics of interest. There were 3,500 abstracts with 10 simultaneous sessions each day. Each World Congress of Neurology has its own flavor, and this one was no different. The Japanese society and the WFN scientific program committee worked tirelessly to produce varied and interesting scientific and teaching programs. The brain alliance partners and neurology specialty organizations offered sessions that enriched the program. The regional neurological association sessions explored topics of their choice to complement the scientific programs. 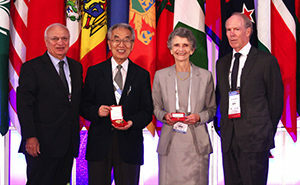 (From left) WFN President Raad Shakir, WFN medalists Professor Jun Kimura and Professor Angela Vincent, and WFN President-Elect William Carroll. During the congress, Professor Jun Kimura, MD (Japan/U.S. ), received the WFN medal for service to international neurology. He has worked tirelessly for decades to promote neurology, and in particular neurophysiology, around the world. The medal for scientific achievement in neurology was awarded to Professor Angela Vincent, MBBS (U.K.), for her decades of dedicated work in the field of neuroimmunology. Professor Jagjit Chopra (India) was recognized with a lifetime achievement award for his work to promote and advance neurology in the developing world. The Council of Delegates was held on Sept. 17. The agenda focused on activities of the WFN during 2016 and 2017. The delegates reviewed the work of the WFN education programs and training centers, with an emphasis on centers branching out from Africa to Latin America. Further expansion to Southeast Asia was discussed. All of these activities are not possible without a solid financial base. The WFN treasurer presented the fiscal report. The WFN is in good financial health and will continue to provide funding for training, education, and research around the world. The delegates approved the annual report and conducted the election of officers and trustees. The WFN is fortunate to have several able candidates wishing to serve in various positions. There were six candidates — two for each of the three posts. 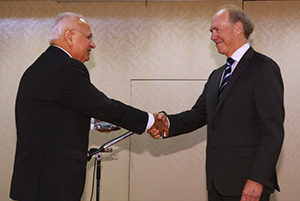 WFN President Professor Raad Shakir (left) greets WFN President-Elect Professor William M. Carroll. Bill Carroll, Ryuji Kaji, and Riadh Gouider were elected. Warmest congratulations to all. I am positive that the WFN is in excellent hands and will continue to move ahead. The officers will start their duties on Jan. 1, 2018. I have to point out that all candidates are highly qualified and dedicated to the WFN’s mission and goals. The Council of Delegates had another important decision to make. The biennial congresses are held around the world and are chosen four years in advance. The 2021 congress is to be held in Europe. Two years ago, applicants were solicited, and the WFN reviewed six cities wishing to be considered. Two withdrew for various reasons; this left Copenhagen, London, Marseille, and Rome in the running. With the assistance of Kenes, the official WFN Professional Conference Organizer (PCO), each site was visited, and a report was prepared. The four candidate cities made formal presentations, and the PCO summed up the opinion on each of the sites. It is obvious that each has its merits and difficulties, which were discussed and debated. The decision is always made by the delegates in a secret ballot. Two rounds of voting were needed to identify a clear winner. It has been decided that the 2021 XXV World Congress of Neurology will be held in Rome. The Italian society will work closely with the WFN to produce a scientific, education, and social program. A timetable was discussed, and work started immediately. The WFN will now concentrate on the 2019 XXIV World Congress of Neurology in Dubai, and the committees are working hard to produce a balanced and interesting program. The Emirates Neurological Society, represented by Dr. Suhail Arukn (WCN XXIV president), promoted the Dubai congress in Kyoto and made sure that all delegates know about Dubai and the preparations that are underway. During the Education Committee meeting, the Education Committee chair and the secretary general presented their reports on the exciting progress of our Teaching Centers in Africa and Latin America, and one that will come in Asia. Centers in Cairo, Dakar, Rabat, and soon Cape Town are progressing well. Mexico City also will start as a WFN Teaching Center in 2017. The WFN leadership made it clear that this is the most cost-effective way to promote neurology in low- and low middle-income countries. The WFN is grateful for national and regional neurological societies that have shared the cost of training. We are indebted to the French and British neurological societies for their contributions. Our partnership with the American and European academies continues to blossom and progress at all levels, including support for regional teaching courses. 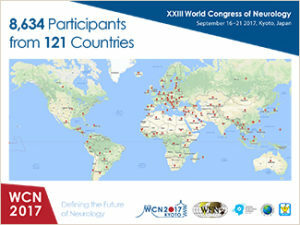 The Japanese Society of Neurology (JSN) held the WCN XXIII in collaboration with the regional association. The Asian Oceanian Association of Neurology (AOAN) served as a partner in organizing the congress, and its attendance was noticeably large. It is now clear that the financial support for Asia will flow from the JSN following the huge financial success of the WCN in Kyoto. 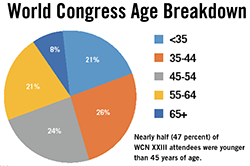 It is quite noticeable that half of the attendees are younger than 45. This encouraging trend has continued since the Marrakesh World Congress in 2011. The WFN is moving ahead with all of its activities, which are cemented by the election of officers and trustees who are dedicated and will definitely build on the current situation in years to come.